Delicious. Made this recipe for a party. Everyone raved and asked for the recipe. It is a bit time consuming to make, but not difficult. I will definitely make again. What type of pan can/should I use? Cast iron, non stick stainless steel etc. Thank you! I made this last weekend and left it for a day to marinate (as suggested)…it was phenomenal. Slow roasting is definitely the way to go. We ate more the next day and it tasted EVEN better than the day before. Wonderful recipe with perfectly detailed directions and lovely photos. Thank you so much! Hi Kelly – hard to say because it will vary depending on size of your vegetables. You can probably just layer it looser to get less in or tighter to fit more and if you have too much left over, maybe use it in a quiche or frittata? 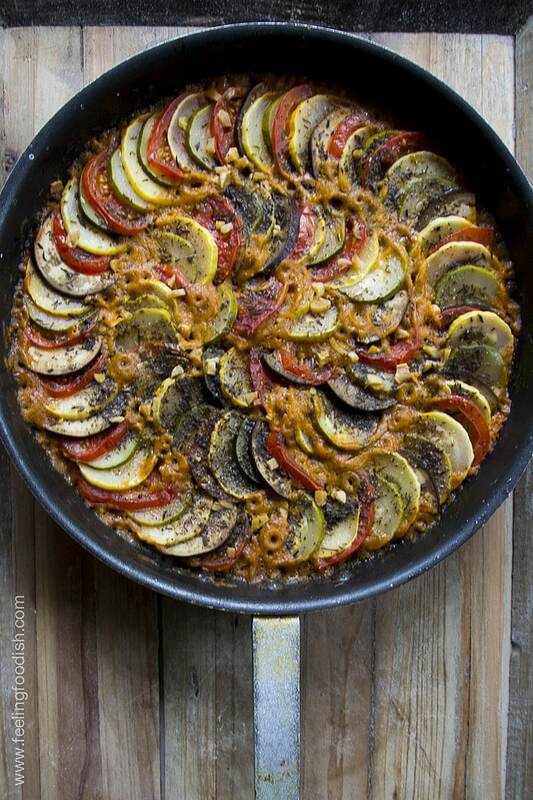 I love eggplant as a pizza topping and squash in minestrone soup! This was fantastic!!!! 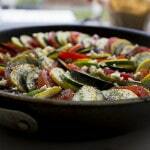 I have tried a ratatouille before and signed the dish off as a mediocre side dish only. I am so glad I found your site and this recipe. It’s so light yet surprisingly hearty– main delicious dish all the way. Thank you so much! Definitely adding to the recipe book! Yay!! I made this Sunday afternoon. So easy to put together, and great to sit and read while the scent of my tasty roasted dinner wafted by! Though I took it out too early, I scooped a little extra out before returning the dish to the oven! It is so delicious, I ate myself sick. I was bummed when I got home from the store to see I’d forgotten a red pepper. If it tasted this good without the pepper, I can’t wait to try it with it. Last night (and tonight) I served it with naan dipped in a spicy oil. Delicious. Future plans include: white bean, quinoa, brown rice. Delicious! Thank you! 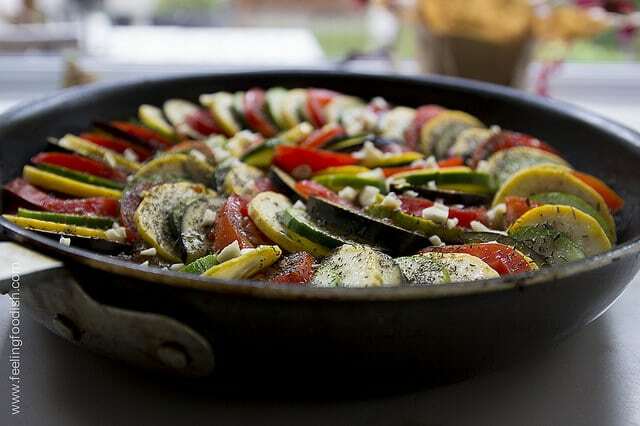 What size pan does this recipe need? I made this in December and it was so good That I’m making it for a dinner party and wanted leftovers so I quintupled the recipe. … Not sure I have a large enough pan to do it in one batch. from what I recall, I used a 12 inch pan. I loved it too! 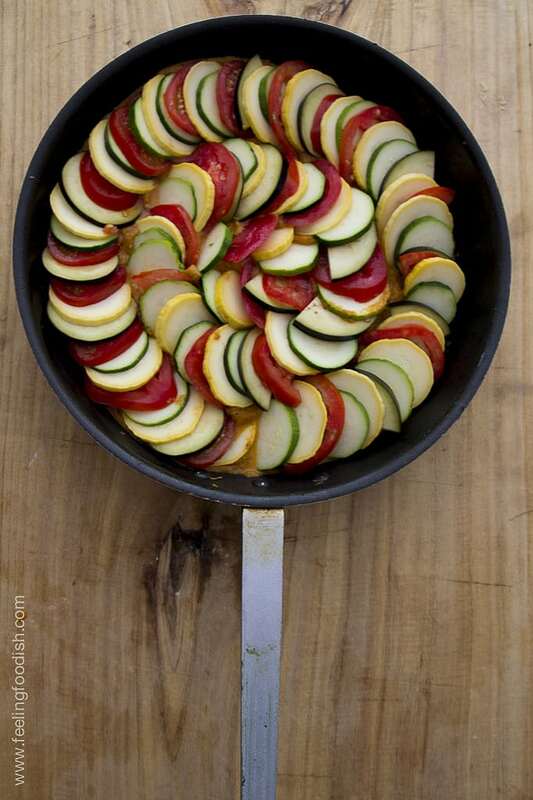 I make ratatouille all the time. Never thought of roasting the veggies instead. I’m looking forward to trying your recipe. Enjoy – hope you like it!